Lerisetron, a competitive serotonin type 3 receptor (5-HT3R) antagonist, contains five functional groups capable of interacting with amino acids in the 5-HT3R binding site. Site directed mutagenesis studies of the 5-HT3AR have revealed several amino acids that are thought to form part of the binding domain of this receptor. The specific functional groups on the ligand that interact with these amino acids are, however, unknown. 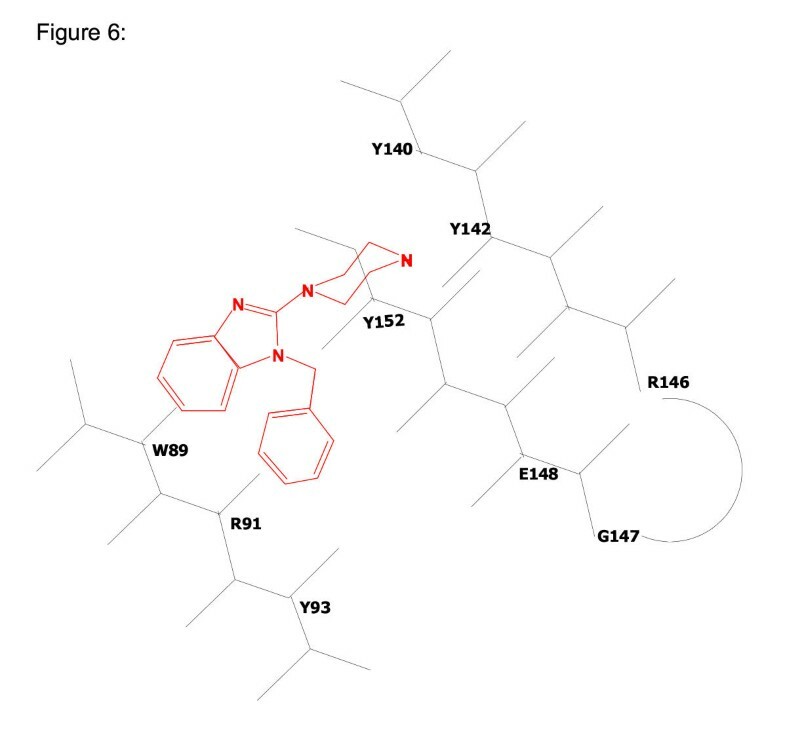 Using synthetic analogs of lerisetron as molecular probes in combination with site directed mutagenesis, we have identified some of these interactions and have proposed a model of the lerisetron binding site. Two analogs of lerisetron were synthesized to probe 5-HT3R functional group interactions with this compound. Analog 1 lacks the N1 benzyl group of lerisetron and analog 2 contains oxygen in place of the distal piperazine nitrogen. Both analogs show significantly decreased binding affinity to wildtype 5-HT3ASRs. Mutations at W89, R91, Y142 and Y152 produced significant decreases in binding compared to wildtype receptors. 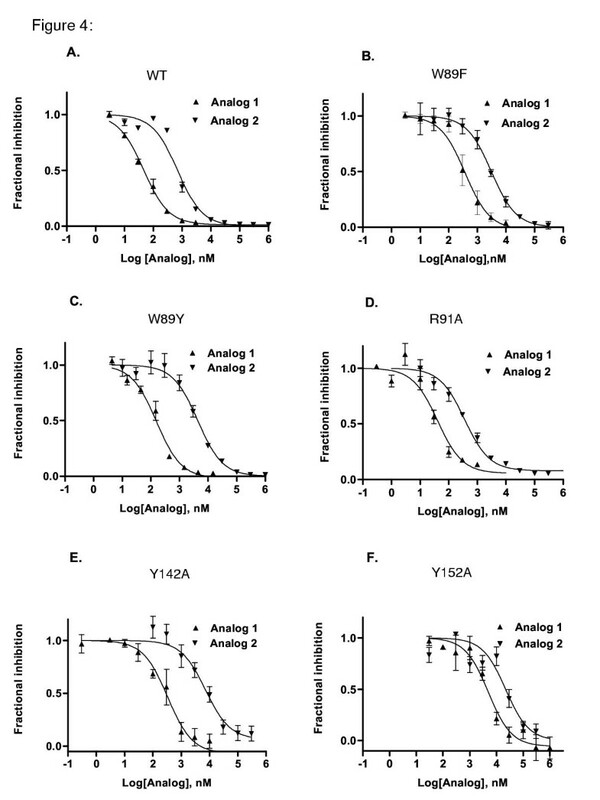 Binding affinities of analogs 1 and 2 were altered only by mutations at W89, and Y152. Based on the data obtained for lerisetron and analogs 1 and 2, we have proposed a tentative model of the lerisetron binding pocket of the 5-HT3ASR. According to this model, The N-benzyl group interacts in a weak interaction with R91 while the benzimidazole group interacts with W89. Our data support an interaction of the distal amino nitrogen with Y142 and Y152. The cysteine-loop family of ligand gated ion channels (LGIC) is comprised of receptors with pentameric quaternary structure and at least two ligand binding sites present at the subunit interfaces [1, 2]. This receptor family is characterized by the presence of a critical disulfide loop structure within the binding site and an integral ion selective channel. LGIC receptors are found in both the peripheral and central nervous systems. Members of this family include the acetylcholine receptors [3, 4], the γ-amino butyric acid type A receptor (GABAAR) , and the glycine receptor (GlyR) . The first subunit of the 5-HT3R was cloned in 1991 . The sequence of this subunit was shown to be highly homologous to LGIC receptors and thus identified the 5-HT3R receptor as another member of this superfamily [7–9]. Similar to other LGIC receptors, more than one subtype has been identified. Two splice variants of an A subunit (long and short forms), and a single B subunit have been cloned [10–13]. Both the long and short forms of the A subunit are capable of forming functional homomeric receptors [5-HT3ALR and 5-HT3ASR] although some differences between an agonist and partial agonist activity have been observed . A third subtype is formed by a combination of the A and B subunits to produce a heteromeric receptor of unknown stoichiometry . Heteromeric receptors are pharmacologically and functionally distinct from the homomeric 5-HT3AL and 5-HT3AS receptors . 5-HT3Rs are distributed throughout the central and peripheral nervous system, playing a significant role in phenomenon such as anxiety, emesis and alcoholism. Antagonists to 5-HT3Rs are clinically efficacious in the treatment of chemotherapy-induced emesis  and recent studies on human subjects have suggested their potential application in the treatment of early onset alcoholism [16, 17]. Hibert et al proposed an early model for the antagonist pharmacophore of the 5-HT3R . According to this model, all 5-HT3R antagonists contain an aromatic ring, a carbonyl oxygen or bioisosteric equivalent, and a basic nitrogen. According to Hibert's model, the basic nitrogen is located 5.2A° from the centre of the aromatic ring and approximately 1.7A° above plane of the ring. The carbonyl oxygen and the aromatic ring are coplanar and separated by a distance of 3.3A°. Recent studies have expanded on this model to include another lipophilic region and a second hydrogen bonding interaction two atoms away from the first [19–21]. A compound that contains all five pharmacophoric regions was synthesized by Orjales et al. This compound (1-(phenylmethyl)-2-piperizinyl benzimidazole or lerisetron) is shown in figure 1 and is a potent 5-HT3R antagonist. Functional groups on this compound capable of forming interactions with the receptor are the distal amino group, a benzimidazole and a benzyl group in the N1 position of the benzimidazole. While Lerisetron contains no carbonyl group, the second nitrogen contained in the benzimidazole heterocycle could act as bioisostere of this functional group . Orjales demonstrated the importance of the N-benzyl group by synthesizing several N1 substituted analogs of Lerisetron. Removal of the N-benzyl group produced a 80-fold decrease in affinity, indicating a role for this group in interacting with the 5-HT3R. Other studies have supported this observation and suggest a more specific electrostatic interaction . 5-HT 3 R antagonists. Granisetron and Lerisetron are shown along with the two analogs utilized to probe the functional group interactions of binding site amino acids. Analog 1 lacks the N-benzyl functional group. Analog 2 contains oxygen in place of the distal piperazine nitrogen. While structure-activity relationship studies and molecular modeling have led to the development of a detailed pharmacophore model, determining specific point interactions between 5-HT3 antagonists and binding site amino acids has proven difficult. Mutagenesis studies have identified the interaction of amino acids W89 and R91 in the binding of 5-HT3R ligands [24, 23]. Studies conducted in our laboratory have identified three additional putative binding site residues (Y140, Y142, and Y152) . W89 and R91 are present in a conserved region of LGIC receptors often referred to as loop D [24, 26]. Similarly, Y140, Y142 and Y152 are located in the region homologus to E loop region of nicotinic AchR. In this study, we have endeavoured to identify the amino acids interacting with the different functional groups present on the lerisetron molecule in order to develop a model for interaction of this compound with the 5-HT3R. Using site directed mutagenesis in combination with analogs of lerisetron, we have identified amino acids that appear to interact selectively with the terminal amino group, the N-benzyl group and the aromatic benzimidazole. Whole cell patch-clamp experiments were performed to test the functional activity of lerisetron. No response was observed when lerisetron was applied alone (data not shown). When co-applied with 5-HT, lerisetron inhibited the absolute magnitude of the response with no apparent alteration of the response profile (Figure 2). The combination of several identical inhibition experiments produced a Ki value of 0.2 ± 0.03 nM for lerisetron inhibition of the 5-HT induced response. These data correspond well with previously reported data for this compound  and verify the competitive antagonist action of lerisetron. Analogs of lerisetron have been shown to inhibit 5-HT3Rs in a similar manner . Inhibition of 5-HT induced responses by Lerisetron. tsA 201 cells transfected with 5-HT3ASR cDNA were clamped at a holding potential of -60 mV and perfused with 4 μM 5-HT (lower trace) or 4 μM 5-HT and 0.3 nM lerisetron (upper trace). Lerisetron reduced the peak 5-HT induced currents from 2.0 nA to 1.0 nA with no change in the response characteristics. An IC50 value was determined by a combination of similar experiments and determined to be 0.4 ± 0.03 nM. The Ki value for lerisetron inhibition of [3H]-granisetron binding to wildtype receptors was determined to be 0.8 ± 0.19 nM (Figure 3 and Table 1). This value agrees with previously published data for this compound. The Ki values for analogs 1 and 2 under identical conditions are 25 ± 3.2 nM and 320 ± 82 nM respectively (Figure 4A, Table 1). The observed change in Ki represents the decreases in binding energy resulting from removal of the N-benzyl group (analog 1) and the distal piperazine nitrogen (analog 2). Inhibition of [ 3 H]-granisetron binding to mutant and wildtype receptors by lerisetron. Competition binding assays were performed as described in Materials and Methods. Each point represents a mean ± SE of n>4 experiments. Ki values calculated from this data and the relative magnitude of the shift in Ki compared to wildtype receptors are shown in Table 2. Y140A produced no significant change in Ki values. W89F, W89Y and R91A mutations produced moderate increases in Ki. Y142A and Y152A mutations resulted in increases in Ki of 160 and 190 fold respectively. Summary of inhibition data obtained for lerisetron, analog 1 and analog 2 on mutant and wildtype receptors. Ki values were calculated from IC50 values as previously described. All data is the result of n > 4 experiments and is expressed as the mean ± SE. The relative change in Ki was calculated as the Ki (mutant) / Ki (wildtype) and indicates the increase in Ki relative to wildtype ± SE. * indicates significant difference in fold change value. Kd values for [3H]granisetron binding to wt and mutant receptors were reproduced from reference 25. In order to determine the nature of the amino acids interacting with the distal amino and N-benzyl groups of lerisetron, we constructed 5-HT3ASRs containing mutations at W89, R91, Y140, Y142 and Y152. Figure 3 shows inhibition of [3H]-granisetron binding by lerisetron on wildtype and mutant receptors. For most amino acids, an alanine substitution was constructed in order to effectively remove any amino acid interaction with the ligand. For W89, an alanine substitution has been shown to prevent binding of [3H]granisetron; therefore a less severe mutation was constructed. The W89F mutation produces a 18-fold change in Kd for [3H]-granisetron binding (18 ± 2 nM) and the W89Y mutation produces a 5.8-fold change in Kd (5.7 ± 0.7 nM). Mutation of amino acid R91 to alanine produced a 5-fold change in Kd for [3H]granisetron binding (4.9 ± 0.7 nM) (Table 1). These data agree well with previously reported values . Alanine mutations at the tyrosine positions Y140, Y142 and Y152 also produced minor increases in Kd for [3H]granisetron binding (2.7 ± 0.19 nM, 4.5 ± 0.5 nM and 7.8 ± 1.1 nM respectively)  (Table 1). Only small changes in Ki for lerisetron were observed for the Y140A mutation while the Y142A and Y152A mutations produced large increases in the Ki (Table 1 and Figure 3). For W89F and W89Y, the changes in Ki observed for lerisetron were much smaller than for the alanine mutations at Y142A and Y152A, as would be expected for the less severe nature of these mutations. The changes were, however significant (p < 0.001 in both cases) and are similar to the changes in Kd reported for [3H]granisetron. The increase in Ki on the W89F mutant receptor was 4.8 ± 0.56 fold and the increase in Ki on the W89Y receptor was 3.6 ± 0.4 fold. The R91A mutant produced an increase in Ki of 7.6 ± 1.5 fold as compared to the wildtype receptor. These data indicated potential interactions of lerisetron with W89, R91, Y142 and Y152. As mentioned above, the lack of [3H]-granisetron binding to W89A mutant receptors necessitated the use of W89F and W89Y mutations to analyze functional group interactions. The effects of these mutations on the Ki for analogs 1 and 2 are shown in figure 4B, 4C and Table 1. Analog 1 inhibited [3H]-granisetron binding to W89F receptors with a Ki of 170 ± 54 nM (7 ± 3.2 fold increase, p < 0.001) and W89Y receptors with a Ki of 81 ± 14 nM (3.2 ± 0.6 fold increase, p < 0.001). This reflects a significant increase in Ki and reflects a potential interaction of analog 1 with W89. The strength of this interaction is apparently similar to the strength of the interaction with [3H]-granisetron and lerisetron since the magnitude of the change is similar in both cases. Analog 2 also showed a significant increase in Ki as a result of the W89F and W89Y mutations. The magnitude of the change for W89F (5.1 ± 1.3 fold, p < 0.05) was similar to that observed for lerisetron and analog 1. The W89Y mutation produced a 6.8 ± 1.6 fold change in Ki (p < 0.05). Thus, all three compounds appear to form similar interactions with W89. Mutation of R91 to alanine (R91A) resulted in a significant, but small increase in Ki for lerisetron of 7.6 ± 1.5 fold (p < 0.01). Figure 4D shows the inhibition of [3H]-granisetron binding by analogs 1 and 2 at R91A mutant receptors. No significant change in Ki was observed on these receptors for either analog 1 (0.9 ± 0.28 fold) or analog 2 (0.56 ± 0.14 fold) (Table 1) as compared to the wildtype receptor. 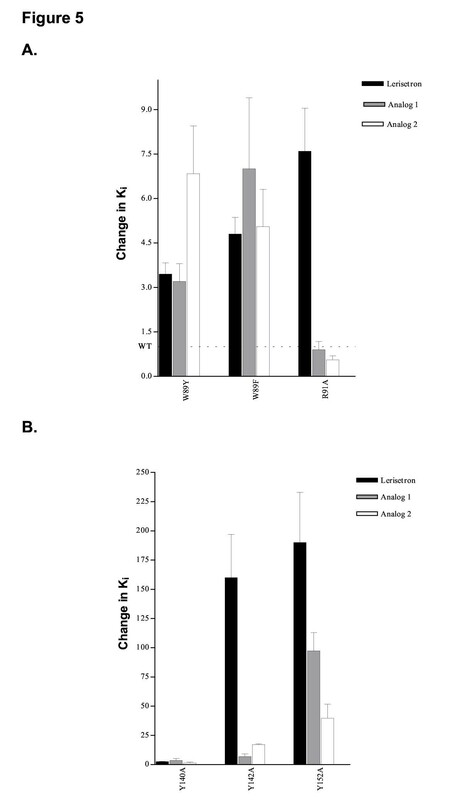 Mutation of Y142 to alanine produced one of the largest observed changes in Ki for lerisetron (Figure 3 and Table 1). The Ki obtained for lerisetron was 130 ± 28 nM, reflecting a change of 160 ± 37 fold compared to wildtype receptors. The Ki value for analog 1, in contrast, increased only 6.8 ± 2.3 fold (p < 0.01) as a result of this mutation (Figure 4E and Table 1). The Ki for analog 2 showed a similar change of 17 ± 0.77 fold (p < 0.01). While these Ki values are significantly different from wildtype values for each analog, the lack of larger effects suggests that neither analog 1 nor analog 2 bind as strongly as lerisetron to Y142. The Y152A mutation showed the most variability in its effects on Ki values for lerisetron, analog 1 and analog 2 (Figure 3, Figure 4F and Table 1). Lerisetron inhibited [3H]-granisetron binding with a Ki value of 150 ± 36; an increase of 190 ± 43 fold compared to wildtype values. The Ki value for analog 1 increased from 25 ± 3.2 nM (wildtype) to 2.5 ± 0.40 μM. This change of 100 ± 16 fold is slightly smaller, but not significantly different from the relative change observed for lerisetron. The Ki for analog 2 increased from 0.32 ± 0.08 μM on wildtype to 13 ± 4.2 μM on Y152A mutant receptors (40 ± 12 fold increase). The increase observed for analog 2 was significantly less than that observed for both lerisetron and analog 1. The smaller change in Ki for analog 2 suggests that analog 2 binds weakly to Y152 while lerisetron and analog 1 bind more tightly. The purpose of this study was to ascertain the functional group interactions of lerisetron with specific amino acids present in the 5-HT3R binding site. To this end, we examined the effects of specific amino acid mutations on the binding of lerisetron and two analogs. 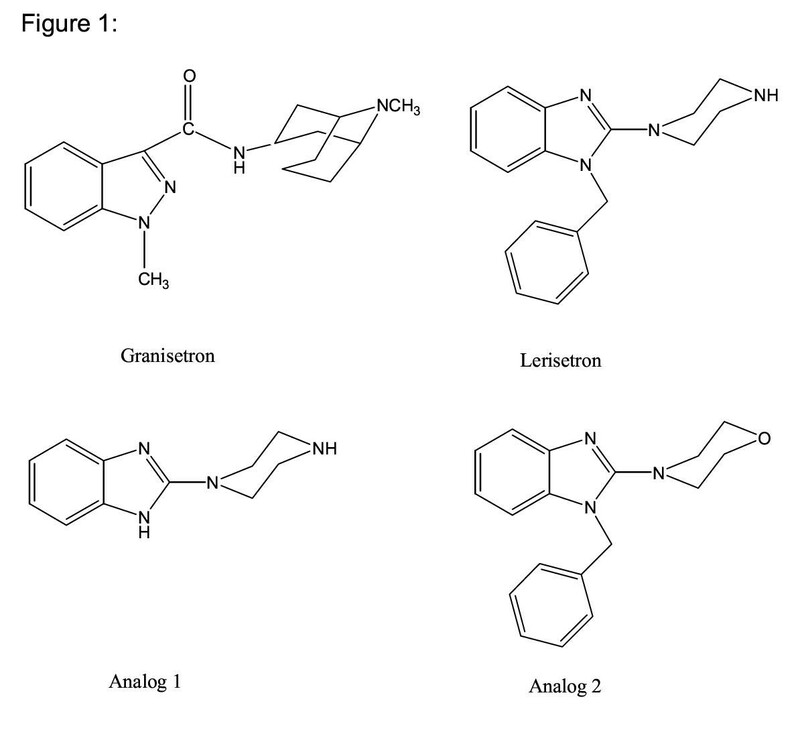 These analogs, shown in Figure 1, are identical to lerisetron in structure; however, each analog lacks a single functional group found in lerisetron. By comparing the effects of a specific amino acid mutation on the Ki for inhibition of [3H]-granisetron binding, we can begin to identify the functional groups likely to participate in that interaction. Five different amino acids were tested: W89, R91, Y140, Y142 and Y152. Each of these amino acids has been shown in previous studies to alter the binding of 5-HT3R ligands [24, 25]. A summary of the changes in Ki is presented as a bar chart in Figure 5A and 5B. 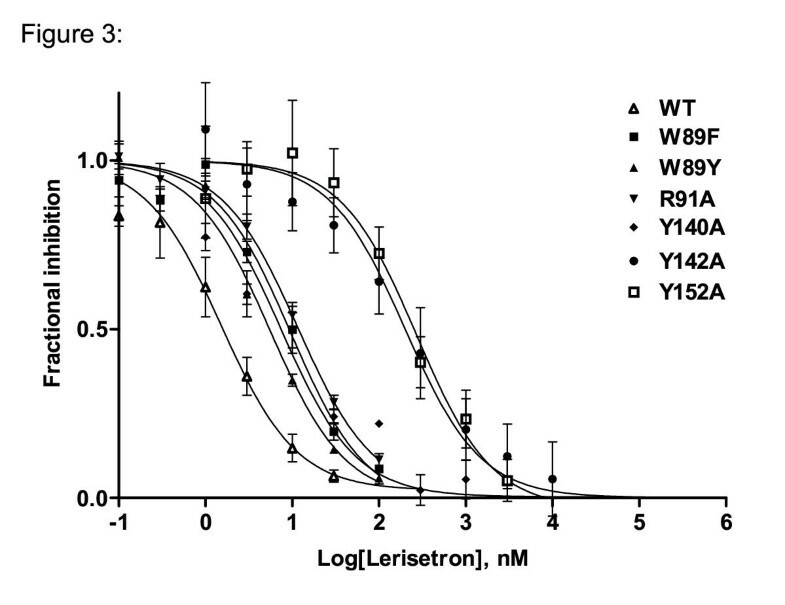 Relative increases in K i for lerisetron, analog 1 and analog 2 on mutant and wildtype receptors. The relative change in Ki was determined as Ki (mutant)/ Ki (wildtype) for each compound. A. W89Y, W89F, R91A B. Y140A, Y142A, Y152A. Lerisetron showed a significant increase in Ki for all mutants except Y140A. Increases in Ki were observed for analog 1 and 2 on W89 and Y152A. While lerisetron binds to wildtype receptors with high affinity, analog 1 binds with lower affinity (31 fold increase in Ki compared to lerisetron). Analog 2, which lacks the terminal nitrogen of lerisetron, binds with even lower affinity (a 400-fold fold increase in Ki compared to lerisetron – Table 1). These data demonstrate the relative importance of the N-benzyl and the terminal nitrogen moieties for lerisetron binding. Cation-pi interactions involving aromatic residues and a quaternary ammonium have been demonstrated to play a major role in binding of nicotinic ligands to nAchRs [29, 30]. Our data support a similar role for Y142 and Y152 in binding of lerisetron to the 5-HT3A receptor. The W89F mutation produced a significant increase in Ki for all three compounds. The magnitude of the change was similar in all cases. In addition, the increase in Ki was identical to the increase in Kd that has been observed for [3H]granisetron binding on this mutant . Alterations in Ki resulting from the W89Y mutation were slightly less, however the change was again the same for lerisetron, analog 1 and analog 2. These data suggest that all three compounds form binding site interactions with W89. The interaction between lerisetron and W89 is unlikely to be via the N-benzyl functional group since the Ki for analog 1 was also altered by this mutation. The same argument can be made for the distal piperazine nitrogen since the Ki for analog 2 also increased. The portion of the molecule common to all three compounds, the aromatic benzimidazole, is thus the most likely point of interaction for W89. The R91A mutation increased the Ki value for lerisetron inhibition of [3H]granisetron binding by 7.6 fold. This is a moderately small change for an alanine mutation, particularly considering that the smallest change in Ki for removal of a functional group on lerisetron (the N-benzyl group) was 31 fold. It is therefore likely that this interaction is either extremely weak or the change in Ki is the result of a structural change in the binding site. Previous studies concluded that R91 was an important interaction for the 5-HT3R agonist 5-hydroxytryptamine (5-HT), since the Ki for 5-HT inhibition increased over 3000 fold as a result of the R91A mutation . A change in Kd for [3H]granisetron binding to R91A was also observed. In order to determine whether the N-benzyl or distal piperazine nitrogen of lerisetron was involved in an interaction with R91, we tested both analog 1 and 2 on R91A mutant receptors. No change in Ki was observed for either compound. This result makes it much more difficult to assign the correct functional group to this amino acid since it suggests that one or both of the compounds is no longer binding the receptor in precisely the same manner as lerisetron. Considering the small change observed for lerisetron binding as a result of this mutation, even a slight reorientation of the molecule in the binding site could result in the loss of this interaction. The Ki values for inhibition of [3H]granisetron binding by analogs 1 and 2 were altered only slightly by the Y142A mutation. The magnitude of the increase in Ki for lerisetron, however, was considerably larger (160 fold) and is indicative of an important interaction of the compound with Y142. The lack of a large change in Ki for both analogs makes it difficult to interpret this data since one or both of the compounds appears to be interacting differently with the binding site than lerisetron. Analogs 1 and 2 differ from each other both in the functional groups contained in the molecule and their structural similarity to lerisetron. Analog 2 is most similar in overall structure. The substitution of oxygen for the distal amino nitrogen alters the potential interactions formed at this position, but is likely to have a small effect on the overall size and shape of the molecule. Analog 1 is far less similar to lerisetron and more similar to the 5-HT3R antagonist granisetron. Previous studies have shown that the binding of granisetron is not affected by the Y142A mutation . Analog 1 may bind more similar to granisetron than lerisetron and thus would be unaffected by mutations at Y142. This is less likely to be the case with analog 2. The strength of the putative interaction at Y142 can be identified by examining the change in binding of lerisetron as a result of the Y142A mutation. The Y142A mutation produced a 160 fold change in Ki. This change reflects the binding energy lost as a result of the alanine substitution. The observed change in Ki on wt receptors is much larger than that observed for removal of the N-benzyl group (31 fold), but is similar to that observed for substitution of the distal amino nitrogen in analog 2 (400 fold). Taken together with the close structural similarity of analog 2 to lerisetron, it can be concluded that comparison of analog 2 and lerisetron should provide the best means of identifying the interaction at Y142. No change in Ki was observed for analog 2 as a result of the Y142A mutation indicating a lack of any significant interaction of this compound with Y142. These data support our hypothesis that Y142 interacts with the distal piperazine nitrogen of lerisetron. A second amino acid may also be involved since the change in Ki for lerisetron binding as a result of the Y142A mutation was smaller than the change produced by substitution of the piperazine nitrogen. As described below, one candidate for this second amino acid is Y152. The Y152A mutation produced increases in Ki for all three compounds although the magnitude of the change differed. The increases in the Ki values were 190 fold for lerisetron, 98 fold for analog 1 and only 40 fold for analog 2. Thus, analog 1 retains much of its ability to interact with Y152 despite the absence of the N-benzyl group, while analog 2 interacts more weakly with this amino acid. Since the Ki for analog 1 is increased by the Y152A mutation, it is unlikely that the N-benzyl group interacts with Y152. The small change in Ki for analog 2 supports a partial interaction of Y152 with the distal piperazine nitrogen although some interaction with another group is also apparent. This other group would be expected to be in close proximity to the distal nitrogen. The most likely candidate is the other nitrogen of the piperazine ring. Thus Y152A may form a partial interaction with both piperazine nitrogens. Figure 6 shows a hypothetical model of the lerisetron-binding site supported by our observations. The model illustrates the secondary structure of the region of the receptor from Y140 – Y152 in a loop configuration. This structure is supported by site-directed mutagenesis data  as well as structural predictions obtained from other LGIC receptors . The recent determination of the structure of a nicotinic acetylcholine binding protein  that shares significant homology with the LGIC family also supports a loop structure in this part of the protein. The region from W89 through Y93 is shown as a β-sheet as has been hypothesized based on site-directed mutagenesis studies of this strand of the 5-HT3R . Our data indicate the functional groups of lerisetron that may interact with W89, R91, Y142 and Y152. Model of the 5-HT 3 R binding site. The model illustrates the major points discussed in the text. Lerisetron is shown spanning the region between the D and E loops of the receptor. Both loops are illustrated as β-sheets as described. The side chains are presumed to point in or out of the page depending on their position. W89, R91, Y140, Y142 and Y152 all presumably extend into the binding site. The terminal piperazine nitrogen is shown interacting primarily with Y142, but is also capable of forming an interaction with Y152. Y152 may also form an interaction with the second piperazine nitrogen. W89 is illustrated as forming an aromatic interaction with the benzimidazole. While R91 is shown in close contact to the N-benzyl group, the data support only a weak interaction at this point. W89 is shown interacting with the aromatic benzimidazole group of lerisetron although the precise position of W89 relative to this group is not known. The W89 interaction with this group is supported by the observed increase in Ki for lerisetron, analog 1 and analog 2. Since the benzimidazole group is common to all three compounds it is the most likely point of interaction. W89 also represents a common interaction in the binding site for both lerisetron and [3H]granisetron. Y142 is shown interacting with the distal piperazine nitrogen possibly through a cation-π interaction. This orientation of an amino group interacting with an aromatic amino acid in a cation-π interaction has been shown for the nicotinic acetylcholine receptor and has been hypothesized for many LGIC receptors [28–30, 26]. This conclusion is based on both the magnitude of the change observed on the wild type receptor for removal of the amino group (400 fold) compared to the effect of the Y142A mutation on lerisetron binding (160 fold) and the lack of any major change in Ki for analog 2 as a result of this mutation. Our data does not support an interaction of this amino acid with either the N-benzyl or benzimidazole portions of lerisetron. Y152 is shown positioned between the two piperazine nitrogens. This conclusion is supported by the smaller increase in Ki for analog 2 (40 fold) compared to that observed for lerisetron (190 fold). These results suggest a partial interaction of Y152 with the distal piperazine nitrogen. Since some change was observed, a second interaction is also likely. The functional group in closest proximity to the distal piperazine nitrogen is the other nitrogen on the piperazine ring. Another possibility would be the N-benzyl interaction, however, since the Y152A mutation also produced a large increase in Ki for analog 2, this conclusion is not supported by our data. R91 is shown as interacting with the N-benzyl group. This is a difficult conclusion to make considering the small effect of the R91A mutation on lerisetron binding. The interaction is included in the model based on structural information obtained from the crystal structure of AChBP . The region of this protein homologous to loop E and loop D of the 5-HT3A receptor suggests a loop structure from Y140 to Y152 and a 3-residue turn containing a glycine at position 147 and the β-strand from W89 through Y93 oriented as shown in Figure 6. The orientation of lerisetron between W89 and Y142A as shown would enable the N-benzyl group to be positioned in close proximity to R91. If this is the case, then a small alteration in position of analog 1 or 2 in the binding site could result in the loss of this presumably weak interaction. The apparent alterations in the binding site location of analog 1 would be consistent with this hypothesis. An alternate hypothesis would place the N-benzyl group in a different position, interacting with another amino acid; either solely or in concert with R91. Our data support a binding site for lerisetron on the 5-HT3R that spans the D and E loop regions. Table 2 shows the sequence alignment for the 5-HT3R, the α7 receptor and the AChBP for these loops. Sequence alignment of mouse 5-HT3 AR, α7 nAchR and AChBP result in alignment of the proposed D and E loop of the 5-HT3 AR with corresponding regions of the α7 nAchR and AChBP. The amino acids W89, R91 Y140, Y142 and Y152 of the 5HT3 A R can be aligned with W53, Q55, L102, R104, and M114 of the AChBP (Figure 6). These amino acids form a cluster in the proposed acetylcholine binding domain of AChBP similar to that proposed in our model. Both loops have been identified on the complementary face of the binding site of the nAChR. It is unknown if lerisetron utilizes amino acids on the principal face although none have been identified. The model for lerisetron binding will be further refined as its interactions with other binding site amino acids are investigated [26, 32, 33]. Of particular interest would be potential interactions of the N-benzyl group that would account for the decrease in binding affinity of analog 2. Additional information gained from comparison of our model with the recent crystal structure of the AChBP demonstrates that lerisetron can be roughly 'fit' into the binding site such that all the residues line up as shown in our model. While this is not direct evidence that the model is correct, subsequent molecular modeling of the data presented in this paper may provide further support for our hypothesis. Our current model provides an initial working hypothesis that can form the basis of further investigation. Also, while it is unclear whether the information obtained in this study can be extended to other 5-HT3R ligands, a similar approach would be useful in identifying functional group interactions for mCPBG, 5-HT, dtC and granisetron. Sequence alignment of the mouse 5-HT3R with the mouse nicotinic α7 receptor and the AChBP. Two sequences are shown. The top sequence is the putative D loop containing W89 and R91 (homologous to W53 and Q55 of the AChBP). The lower sequence shows the putative E loop and contains Y140, Y142 and Y152 (homologous to L102, R104 and M114 of the AChBP). Wild type 5-HT3AS mouse receptor cDNA was derived from N1E-115 neuroblastoma cells as previously described . Mutant receptors were constructed using polymerase chain reaction (Quick change mutagenesis kit, Promega). All mutations were confirmed by DNA sequencing. tsA201 cells (a derivative of the HEK293 cell line) were grown in Dulbecco's modified Eagles medium (D-MEM) containing 10% FBS and 100-units/ml penicillin/streptomycin. Cultures were maintained in humidified atmosphere of 5% CO2 at 37°C. For binding studies, tsA201 cells were plated at a density of 5 × 106 cells/75 cm2 and grown for 9 hours prior to transfection. Cells were transfected with 10 μg murine 5-HT3ASR cDNA using calcium phosphate co-precipitation (New Life Technologies, NY), then incubated 36 hours prior to harvesting. For whole cell patch clamp experiments, tsA201 cells were plated at a density of 0.25 × 106 cells/27 cm2 dish and grown 12 hours prior to transfection. Cells were washed with fresh culture medium then transfected with 10 μg 5-HT3ASR cDNA using Qiagen Superfect transfection reagent (Qiagen, CA). Transfected cells were incubated with this mixture for 2.5 hours, then divided into 35 mm culture dishes at a density of approximately 5 × 104 cells/dish and incubated for 24 hours at 37°C before recording. Transfected cells were scraped from the dishes, washed twice with Dulbecco's PBS (New Life Technologies, NY), then resuspended in 1.0 ml PBS/100 mm dish. Cells were either used fresh or frozen at this step until needed. Immediately prior to use, cells were homogenized in PBS using a glass tissue homogenizer then centrifuged at 35 000 × g for 30 minutes in a Beckman JA20 rotor. Membranes were washed once more with PBS then resuspended in 1 ml PBS/100 mm dish. Protein content was determined using a Lowry assay (Sigma. Diagnostics, St. Louis, MO). Binding assays were performed in PBS. For Kd determinations, 100 μl of homogenate was incubated at 37°C for 1 hour with varying concentrations of [3H] granisetron (NEN, MA). Specific binding of [3H] granisetron was determined as the bound [3H] granisetron not displaced by a saturating concentration of a competing ligand (100 μM mCPBG or 10 μM MDL-72222). Kd values were determined by fitting the binding data to the following equation using GraphPad PRISM (San Diego CA): B = Bmax [L] n / ([L] n + Kn), where θ is bound ligand, Bmax is the maximum binding at equilibrium L is the free ligand concentration and n is the Hill coefficient. For Ki determinations, 100 μl of homogenate was incubated at 37°C for 2 hours with varying concentrations of inhibitor and [3H] granisetron (NEN, MA). Binding was terminated by rapid filtration onto a GF/B filters. The IC50 values were calculated by fitting the data to the following equation using GraphPad PRISM (San Diego CA): θ = 1/ (1+(L/IC50)), where θ is the fractional amount of [3H] granisetron bound in the presence of inhibitor at concentration L as compared to the amount of [3H] granisetron bound in the absence of inhibitor. IC50 is the concentration at which θ = 0.5. The Ki is calculated from the IC50 value using the Cheng-Prusoff equation. Transfected tsA201 cells were transferred to a recording chamber and submerged in extracellular recording buffer containing 25 mM HEPES pH 7.4, 140 mM NaCl, 1.7 mM MgCl2, 5 mM KCl, 1.8 mM CaCl2. Patch electrodes (2–2.5 MΩ) were filled with intracellular recording buffer containing 25 mM HEPES pH 7.4, 145 mM KCL, 2 mM MgCl2 and 1 mM EGTA. Cells were clamped in whole cell configuration at a holding potential of -60 mV. Currents elicited by agonist application were measured using an Axopatch 200B amplifier (Foster City, CA) under computer control (DataPac 2000, RUN Technologies). Agonists and antagonists were dissolved in extracellular solution and delivered to cells using a rapid perfusion system (Warner Instruments, Hamden, CT). For EC50 determinations, responses were normalized to the maximum response obtained from the full agonist 5-HT and fitted to the equation Ψ= 1/1+(EC50/ [C] n), where Ψ is the normalized current at 5-HT concentration [C], EC50 is the concentration of 5-HT needed to obtain half maximal activation and n is the apparent Hill coefficient. For inhibition experiments, cells were exposed to inhibitor alone for 30 s prior to co-exposure with 5-HT. Inhibited responses were calculated as a fraction of the response to 5-HT alone. Data were plotted as the fractional response versus the concentration of inhibitor and analysed using GraphPad software. The IC50 value was calculated as the concentration of antagonist inhibiting the 5-HT evoked response by 50%. A Ki value was calculated from the IC50 using the Cheng-Prusoff equation. All target molecules were prepared according to a general 2-step synthesis reported previously by Orjales et al. with only slight modification [22, 23]. Commercially available 2-chlorobenzimidazole, in dry DMF was treated with a slight excess of NaH, (1.1eq). After stirring for 1 hour at room temperature, one equivalent of the appropriate alkyl bromide was added slowly and the reaction mixture heated under reflux for > 5 hours (the reaction was monitored by TLC). Reaction product was partitioned between water and methylene chloride; organic layer was dried (Na2SO4) and concentrated in vacuum. The solid residue was purified by Flash chromatography, which afforded the corresponding N-substituted 2-Chlorobenzimidazole intermediates in good yield. The final step involved a nucleophilic substitution of the 2-chloro group by piperazine at high temperatures. The reaction was performed neat using 4–10 fold excess piperazine and typically heated for a short period only, (30–45 min). Similar work-up afforded a residue that was purified by either crystallization or chromatography. The yields ranged from 40–95%. All compounds were characterized by NMR, MS, HRMS, and /or elemental analysis or were identical to literature reports. D-MEM, Penicillin-Streptomycin, fetal bovine serum, and Trypsin were obtained from New Life Technologies. 5-HT and MDL-72222 were obtained from RBI. [3H]-granisetron (84 Ci/mmol) was purchased from New England Nuclear. This work is supported by the University of Louisiana, College of Pharmacy and grants from the American Heart Association.